This event filled with pomp and colour took place on Saturday, 11th March 2017. The venue of the inaugural championship was the indoor arena at the Moi International Sports Centre, Kasarani. Schools started streaming into the venue as early as 12:00pm for a 2:00pm kick off. A total of 30 schools turned out for the event. These 30 schools will represent the 30 teams that make up the actual NBA tournament in the United States. Before this day, three coaches, namely Mr. Brian Njoroge, Mr. John Thomas Nyakundi and Mr. Brian Abuto, were taken through rigorous coaching courses at USIU on Thursday and Friday to enlighten them on the tactical, technical and physical facets of the game. The Under 12 School Team comprising of 13 Standard 6 boys namely James Kiumi, Terema Matiko, Benedict Mbalu, Michira Mbugua, Philip Mugambi, Sean Muiga, Victor Nzoka, Paul Ochieno, Edwin Okwach, Mark Towett and Jeremy Wachira arrived at the venue shortly after 1:00pm. Lunch was served by 1:30pm. At 2:00pm the speeches were given namely by the US ambassador to Kenya, the Director of Operations of the NBA, a basketballer for the women’s version of the NBA (WNBA) and a representative from Ford Company, Ryan Majiwa, who is an old boy of the School (F4 2003). Ford is sponsoring the Championship. After the speeches the crowd was entertained by professional dunkers from the United States who left the crowds mesmerized at their athletic prowess. The event concluded with an exhibition match. Each of the teams was to be given a kit of one of the 30 NBA teams through a kind of draft selection. 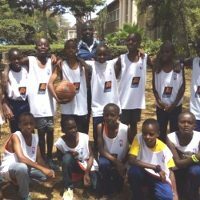 Strathmore School selected the Phoenix Suns kit. The team has received 10 training balls.